Today’s Station takes place in the Church of St. John before the Latin Gate. This ancient basilica is built near the spot where the beloved disciple was, by Domitian’s order, plunged into the cauldron of boiling oil. Very near the ancient Porta Latina in the Aurelian Wall is a delightful little Renaissance chapel named San Giovanni in Oleo. Here marks the legendary spot where the Evangelist was boiled in oil, from which ?he came forth as from a refreshing bath? ? an event which is said to have occurred before he went to the Island of Patmos. This tradition is consecrated in the writings of Tertullian, and a cappelletta has existed here since before the time of Boniface VIII (1294-1303). The present octagonal chapel was built in 1509 by the Frenchman, Benoit Adam, and it was again restored by Borromini in 1658. Today is one of the few days that it is open. Across the road, down a blind alley, rises today?s station church, the very ancient Basilica of San Giovanni a Porta Latina. 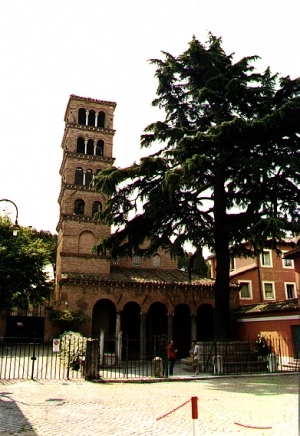 Dedicated to the beloved disciple of Jesus, this church stands as the most ancient and venerable monument of Saint John the Evangelist?s sojourn in Rome. It is perhaps the most picturesque of the old Roman churches. The enormous conifer which shades the antique well standing in the forecourt, plus the classical columns which support the medieval portico, and the superb twelfth-century campanile, add up to an extraordinarily beautiful scene. The church was originally reconstructed by Celestine III in 1191; subsequently, it was restored several times more. The care of the church has changed hands many times as well. It has belonged to the Lateran Chapter, the Augustinians, the Confraternity of San Petronio di Bologna, the Mercedaen Scalzi, and the Minimi di San Francesco da Paola (who were driven out by the French in 1798). The State took over part of the buildings in 1873, and in the same year the Franciscan Tertiaries of Albi took charge until malaria drove them away. Then came the Blue Sisters (the Sisters of Santissima Annunziata) who enclosed themselves in the convent. Meanwhile, the whole area was cleared of swamp, improved, and became a residual quarter. Finally in 1937 the church and the buildings attached to it were entrusted to the Institute of Charity (Rosminians) who have carried out much restoration work. The interior of San Giovanni preserves the striking simplicity of its very early origins. Ten beautiful antique columns of varying styles line the aisles; these lead to two minor apses, flanking the main one, in the oriental fashion. As a very unusual feature, the three apses are polygonal on the outside, and the central one is pierced by three selenite windows. The twelfth-century frescoes, restored in 1940, are also exceedingly interesting. They depict scenes from Genesis, the Creation and Fall of Man, and from the New Testament, the Redemption. The Old Testament scenes start on the right side near the sanctuary, and the New Testament scenes are painted below them in two tiers. In the central apse are 12th century paintings of the twenty-four Elders of the Apocalypse and symbols of the Evangelists.